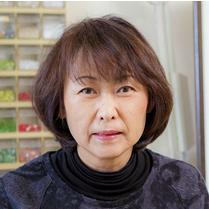 Yasuko Nakazato has been designing award winning glass kaleidoscopes since 1998. Her work is exhibited in museums and shows across Japan including the Sendai Kaleidoscope Museum of Art. Her newest series is inspired by KATAGAMI, the more than 100 year old Japanese art of producing patterns on textiles and leather by means of a paper stencil. She uses designs from the Meiji, Taisho and Showa periods.